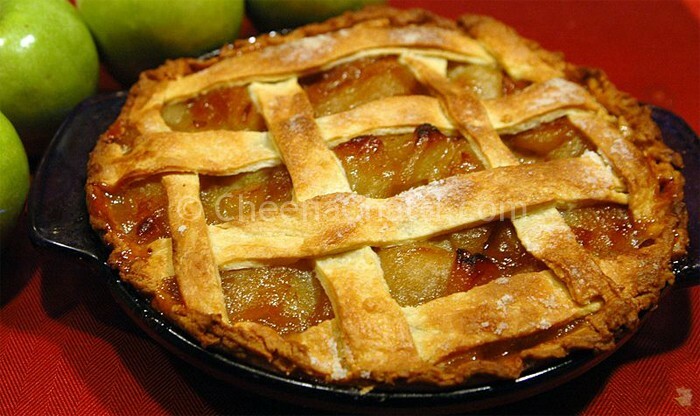 Apple pie is a dessert of enduring popularity originated in America. There is even a saying America, “as American as apple pie” which means “typically American”. Its a fruit pie (Tart) with main ingredient as apple and served hot or cold, or with ice cream /whipped cream or on its own. In a large bowl empty 2 1/2 cups of flour and mix in butter with your fingers until the mixture resembles breadcrumbs. Add in water, a little by little until the mixture comes together to form a ball. Knead lightly and put into a plastic wrap and refrigerate for 30 minutes. For the filling, mix chopped apple, sugar, brown sugar, 1 table spoon flour, lemon rind and cinnamon powder in a bowl and keep aside. Take out the ball pastry from fridge and divide it into two, one a little larger than the other. Roll out both to a thickness of 1/8 inch. Use the smaller circle to cover the base and sides of an 8 inch pie dish. Fill this with the apple mixture. Cut out stripes of 1/2 inch thickness from the larger circle and place them in a criss-cross manner over the apple filling. Trim the edges along the dish. Preheat the oven in 180 degrees. Brush the top with beaten egg and bake the pie in 180 degrees for 40 minutes or until the top is golden brown. Sprinkle powdered sugar and serve hot with any flavored Ice cream. Unfortunately I missed my original photographs of this preparation. Thanks to Wikipedia for providing with a beautiful photograph of Apple pie. This entry was added on September 4th, 2013 by Athira Sooraj in Bakery and tagged with pies, bakery, apple pie, apple. Last revised on March 31st, 2018.